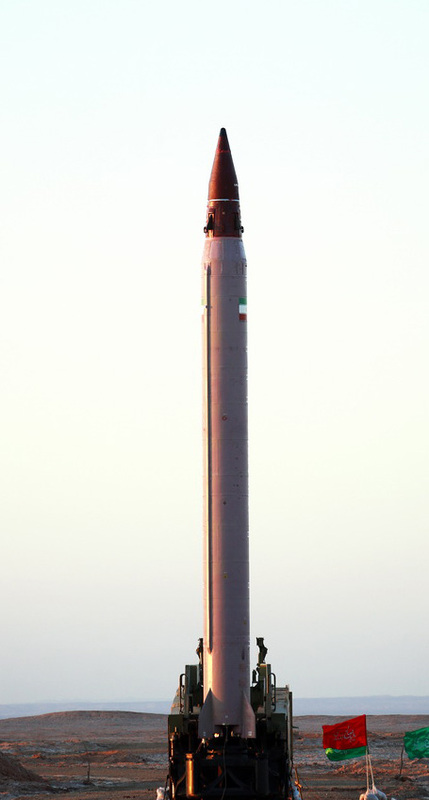 Iran has successfully test fired a new, domestically-produced, medium-range ballistic missile, namedEmad (pillar, in Farsi). “This is Iran’s first medium-range missile that can be guided and controlled until hitting the target,” Iran’s Defense Minister Hossein Dehghan was quoted as saying. According to analyst estimates the new missile could be ready for service next year. The Islamic Republic of Iran already has surface-to-surface missiles with ranges of up to 2,000 kilometers that can hit Israel and US military bases in the region. The new missile seems to be a derivative of these liquid-propelled Ghadr and Shahab missiles. This Medium-Range Ballistic Missile (MRBM) is also powered by liquid-fuel and; according to unconfirmed sources, it has a range of up to 1,700 km., (1,060 miles) carrying a payload of 750 kg (1,650 pounds). Its accuracy is estimated at 500 meters (1,650 ft), compared of 2,000 meters (1.2 miles) accuracy achieved by the current Shahab 3 missile. "The successful test-firing of Emad missile, as a major stride in this field, led to a change in the world's strategic thinking about the Iran and disturbed the balance," Salami said, addressing a forum in Tehran on Tuesday. On Tuesday, Iran unveiled a new subterranean storage facility, the latest piece of its expanding missile program. The move is likely to anger officials in the US, who have already threatened to apply new sanctions, despite the promises of the Iran nuclear deal. Airing on Tasnim news agency and state television, the footage shows a state-of-the-art missile depot beneath an Iranian mountain range. Administered by Revolutionary Guards, the facility was inaugurated by Ali Larijani, the speaker of the Iranian parliament. The depot is needed to ease overcrowding in similar sites, and houses a stockpile of Emad precision-guided missiles. The unveiling comes after Iranian President Hassan Rouhani announced plans to expand the country’s missile defense program. On Friday, Defense Minister Hossein Dehqan said that the program was necessary for national security. "Iran boosts its defense capabilities in accordance with its objectives and its national interests," he said, according to IRNA News. He also added that the current situation in the Middle East required peace and security that can only be provided by the existence of strong military forces. While Tehran has stressed that the program is in no way meant to provoke Washington, US officials have nonetheless expressed outrage. Military analysts say that the Emad missiles could, in theory, carry a nuclear warhead. Last Wednesday, US officials speaking on condition of anonymity indicated that the US Treasury Department was preparing a new round of sanctions against companies and individuals associated with Iran’s test-firing of two ballistic missiles. Washington called these launches a violation of international law, though Tehran maintains that the tests were conducted in accordance with UN regulations and to be used for defensive purposes. The threat of new penalties came as the international community is working to lift sanctions related to Tehran’s nuclear program. Following the nuclear deal agreed to by Iran and the P5+1 nations – China, Russia, the US, the UK, France, and Germany – the Iranian government has worked steadily to eliminate its uranium supplies. While US officials insisted that any fresh sanctions would be unrelated to the nuclear deal, Iran warned that new financial penalties would be viewed by Ayatollah Ali Khamenei as a breach of the agreement. On Friday, the White House announced that it planned to delay the implementation of new sanctions. It remains unclear whether Tuesday’s unveiling will reinvigorate calls for financial penalties. Tehran has also recently accused Washington of violating the nuclear deal. Following the San Bernardino shooting in December, the US Congress passed laws requiring any foreign national who has visited Iran or Syria to obtain a visa before entering the United States. Iran claims the legislation could harm Iranian businesses and cut off access to foreign investment. Beyond protests and vacuous statements of concern, Israeli experts concede Prime Minister Benjamin Netanyahu and his backers in the Western world lack leverage to penalize Iran for its steadily advancing ballistic missile program. That’s because there’s nothing in the nuclear deal negotiated between world powers and Iran to prevent the types of launches that took place last week, less than two months after the so-called Joint Comprehensive Plan of Action (JCPOA) took effect, experts said. “There’s nothing in the JCPOA with regard to ballistic missiles because the P5+1 conceded on that point as soon as the negotiations began,” Emily Landau, senior research fellow at Tel Aviv’s Institute for National Security Studies, said of the five permanent members of the UN Security Council and Germany, which negotiated the landmark Iranian nuclear deal. There’s also nothing, experts here say, in UN Security Council Resolution 2231 from July 2015 that expressly proscribes development and testing of the nuclear-capable missiles Tehran launched to much fanfare over two days last week. “Resolution 2231 ‘calls’ on Iran not to test nuclear-capable ballistic missiles, but it doesn’t ‘demand’ they do so,” Tal Inbar, head of the Space Research Center of the Fighter Institute for Air & Space Strategic Studies, told Defense News. “There’s no punishment … and it’s silly for Netanyahu to think otherwise,” Inbar said. Following the series of March 8-9 launches, Netanyahu exhorted world powers party to the so-called P5+1 deal to “prevent Iran” from violating UN Security Council decisions. “It cannot be that Iran will not be punished for this,” Netanyahu told Cabinet ministers March 13. According to Netanyahu, action by the US and other parties to the deal with Iran is imperative to deter future provocations and violations of existing agreements. “I think this is important in and of itself, but it is also important as a test of the major powers’ determination to enforce the nuclear agreement with Iran. … We expect answers,” Netanyahu said. Landau noted that officials in the US and some EU member states have expressed concern for what Samantha Power, Washington’s ambassador to the UN, described as Iran’s “provocative and destabilizing” missile tests. Power said she would take up the issue in the UN Security Council while EU foreign ministers met Monday in Brussels to discuss potential punitive options. French Foreign Minister Jean-Marc Ayrault told reporters in Paris that France “condemns” the Iranian missile tests. “If necessary, sanctions will be enacted,” Ayrault said. “The good news is that we’re seeing a lot of pressure from different directions, but the bad news is that it’s not likely to change things fundamentally,” Landau said. “I suspect this is going to be an ongoing dispute between the P5+1 and Iran. … There’s a dynamic in place whereby Iran views any attempt to level sanctions [relative to nuclear-capable ballistic missiles] as undermining JCPOA. And because P5+1 states want to preserve the JCPOA, this deters them from acting on the missile issue,” Landau said. Shmuel Sandler, a foreign policy specialist at the Begin-Sadat Center for Strategic Studies – a conservative Israeli think tank – said Netanyahu’s options are limited as long as US President Barack Obama remains in office. Meanwhile, an Israeli government source said Netanyahu is expected to keep “a supportive, but relatively discreet distance” as Republican and Democratic members of Congress mull extension of US sanctions on the books. Senate Foreign Relations Committee Chairman Bob Corker, R-Tenn, told reporters there was “strong bipartisan movement in the Senate” to extend the Iran Sanctions Act, which expires in December. “Clearly the current ballistic missile sanctions regime is ineffective,” March 13 editions of The Hill newspaper quoted Corker as saying. Netanyahu declined an invitation to appear at an upcoming annual policy meeting of the American Israel Public Affairs Committee, the pro-Israel lobby, ostensibly for fear of not wanting to be perceived as meddling in a US election cycle. A solid-fuel rocket engine North Korea tested in March was built with technology from Iran, an Israeli analyst said. Tal Inbar, of Israel's Fisher Institute for Air and Space Strategic Studies, said Pyongyang has also made significant progress in developing ballistic missile technology, Voice of America reported Tuesday. Inbar made the statements at a congressional briefing addressing the "ballistic axis," a reference to Iran's and North Korea's space program. The analyst also said a significant portion of North Korean missile technology was being shared with Iran. On March 24, Kim Jong Un stated a "successful" test of a solid-fuel rocket engine was completed, adding that he wanted to increase the power of North Korea's ballistic missiles that can "ruthlessly beat down hostile forces." Inbar said the propellant on the North Korean engine is identical to the technology developed in Iran. The solid-fuel propellant North Korean news agency KCNA featured was 1.25 meters in diameter, and included details that can be found on the Sejjil, the Iranian solid-fueled ballistic missile. The Sejjil is capable of traveling 1,200 miles. North Korea could have procured the technology either directly or indirectly. Inbar also said North Korea's Hwasong-13 missile – sometimes known as the KN-08 ICBM – could have a warhead component that measures more than 20 inches in diameter. North Korea could mount a warhead yielding 40-80 kilotons on the missile, the analyst said. "A missile with a 2,000-kilometre range was tested two weeks ago," said General Ali Abdolahi, adding that it has a negligible margin of error of just eight metres (yards). Iran launched a new long-range missile late last month, a general announced on Monday, trumpeting the accuracy of the latest such weapon to be test-fired in defiance of the West. "We can guide this ballistic missile. It leaves the Earth's atmosphere, re-enters it and hits the target without error," the armed forces deputy chief-of-staff said, quoted by the website of state broadcaster IRINN. However, several hours later, Defence Minister General Hossein Dehghan denied that such a test had taken place. "We have not tested a missile with such a range as media reports said," he said, quoted by the official IRNA news agency. In early March, Iran carried out several short-, medium- and long-range (300 to 2,000 kilometres) precision missile tests across its territory, mostly from underground bases.The series of tests has come in for criticism from the United States, Britain, France and Germany. They say the tests violate United Nations resolutions, and have called on the Security Council to address them. Opponents of the programme say the weapons are capable of carrying nuclear warheads, an argument categorically denied by Tehran's political and military authorities.Tehran's ballistic missile tests in late 2015 brought new sanctions by the US against Iran on January 17. The punitive measures were announced a day after international sanctions were lifted following the entry into force of a July 2015 nuclear agreement. Iran's parliament, whose mandate expires at the end of May, passed new legislation this month that boosts the country's ballistic capability. President Hassan Rouhani and senior Iranian military officials have also said in recent months that ballistic missiles must be enhanced in order to boost Iran's deterrent power. The deputy commander of Iran's powerful Revolutionary Guard declared Friday that there are tens of thousands of missiles in Lebanon ready to strike Israel. "Hezbollah has 100,000 missiles that are ready to hit Israel to liberate the occupied Palestinian territories if the Zionist regime repeats its past mistakes," Gen. Hossein Salami was quoted as saying by Tasnim, according to Reuters. “Today, the grounds for the annihilation and collapse of the Zionist regime are (present) more than ever,” he said. Additionally, state TV reported Iran’s President Hassan Rouhani accused the West of trying to exploit differences between Shiite and Sunni Muslims to divert attention from the Palestinian-Israel conflict. "The global arrogance (the United States and its allies) wants to create discord among Muslims ... Unity is the only way to restore stability in the region," Rouhani said. "We stand with the dispossessed Palestinian nation." Rouhani spoke as tens of thousands of Iranians joined in an anti-Israel rally to express support for the Palestinians. The demonstrators shouted "Death to Israel" and "Death to America" and while they burned an Israeli flag. “The Zionist regime (Israel) is a regional base for America and the global arrogance ... Disunity and discord among Muslim and terrorist groups in the region ... have diverted us from the important issue of Palestine," Rouhani added. Israeli opposition has been a policy of Tehran’s since the 1979 Islamic Revolution. Shiite Muslim Iran has backed Palestinian and Lebanese militant groups who oppose peace with Israel. There can not be peace with your slavers, invaders and murderers. This is an article from 2011 buried in a VT current thread. I am linking it as it shows how vulnerable Iran thought US bases were to Iran's surface to surface missile systems back then. Must be more vulnerable now given their advances in ballistics. This is the start of it, about halfway down the thread, the rest of the thread might raise a smile or two. On December 14, 2011, the Mashregh News web site, which is close to Iran’s security circles, published an article examining Tehran’s ability to strike at U.S. bases in the region. 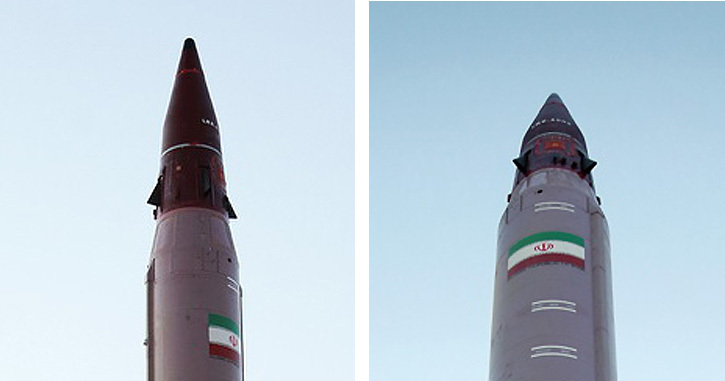 The article included statistics about the bases and their respective distances from Iran’s borders, and about the missiles that Tehran would use against them. The list included U.S. bases in Saudi Arabia, Turkey, Qatar, Kuwait, Afghanistan, Bahrain, the UAE, Oman, Kyrgyzstan, and Pakistan. This is the main reason why Iran has not been attacked, because it will fight back and retaliate strongly with thousands of ballistic and cruise missiles. Oil will go to $500/ barrel over night as Sawdi/ Kuwaiti/ UAE and Qatar's oil terminals and refineries go up in flames in under 10 minutes if war started with Iran. A war with Iran will destroy the global economy. JohninMK wrote: This is an article from 2011 buried in a VT current thread. I am linking it as it shows how vulnerable Iran thought US bases were to Iran's surface to surface missile systems back then. Must be more vulnerable now given their advances in ballistics. US Secretary of State Rex Tillerson has called on Iranian President Hassan Rouhani to end the country’s ballistic missile tests in what is Washington’s first reaction to his re-election. Tillerson made the remarks during a joint news conference with his Saudi counterpart on Saturday following Rouhani’s landslide election victory and winning a second term in office through presidential polls held on Friday.He repeated a Western accusation that Iran supports terrorism, saying, "What I would hope, is that Rouhani... use that (new) term to begin a process of dismantling Iran's network of terrorism, dismantling its financing of the terrorist network, dismantling the manning and the logistics and everything that they provide to these destabilizing forces that exist in this region." "We also hope that he puts an end to their ballistic missile testing," Tillerson said on the first day of a visit by President Donald Trump to Saudi Arabia where he signed a whopping $110 billion weapons deal with the Saudi kingdom. TEHRAN (FNA)- Commander of Iran's Islamic Revolution Guards Corps (IRGC) Aerospace Force Brigadier General Amir Ali Hajizadeh announced on Thursday that the country has built a third underground missile production factory recently. "We will increase our missile power. Our enemies, the United States and the Zionist regime (Israel) are naturally upset and get angry at our missile production, tests and underground missile facilities because they want Iran to be in a weak position," Hajizadeh said at a public meeting with people in the Southwestern city of Dezfoul on Thursday. "Iran's third underground factory has been built by the IRGC in recent years," he added. The General further pointed out that the IRGC plans to build its first ground-to-ground ballistic missile that will be named 'Dezfoul' in the near future. The phoenix SLV , can be turned into ICBM . But in order to do this , the sattelite itself must be turned into a re-entry vehicle . And brought down over a precise location . So Iranians can have a programme to return the sattelite to Earth . Over Iranian territory . The re-entry vehicle can carry a useful load . Like a camera and film . High definition . An accuracy of one or two kilometers is required . With specific warheads . The Emad MRBM accuracy can be improved . If it relies on GPS . Then this is not reliable . Can be jammed . Accuracy can be improved in similar way to Pershing II missile . But instead of terminal active radar homing . Which can be tracked . A passive optical / IR , topographic terminal homing is better . Accuracy of 500 meters with conventional warhead of 750 kg , should be improved , ensuring target destruction .This assuming singular warhead for point destruction ( underground concrete bunkers ) , rather than multiple warheads , smaller , for area destruction over ground , like planes , tanks , buildings . Requiring less accuracy . Iran’s new homegrown ballistic missile that was unveiled on Friday can be guided through the final moments of engagement with the target, Defense Minister Brigadier General Amir Hatami said, describing it as a “strategic missile” at Iran’s disposal. In comments on Saturday, General Hatami said that its remarkable operational range and unique features have made Khorramshahr a very agile missile.